I have three great tips for you in this video PLUS an exercise that will help you clear out the energy once it’s in your system. Your “assignment” for this video? Try the 5 step process. 1. How was the process? What did you notice? 2. What practices do YOU use to keep other people’s energy out of your own?? What works well for you? 3. 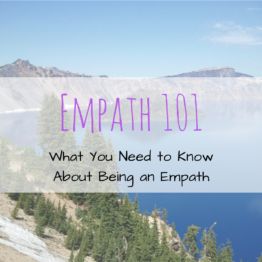 What are you struggling with as an Empath? That was very helpful & exactly what I needed at that moment. I felt an immediate lightness & had no problem consentrating on white light. I normally use crystals or sage myself and sometimes walking in dirt barefoot brings me back to myself as well. This was very helpful because I do struggle as an empath & feel people are drawn to me so they can unload. I at times have to completely block them out with walls like a fortress. This isn’t always possible being a caring empathic person I want to help them so I walk away with all there issues sometimes unknowingly. Crystals and sage are beautiful! I use them, too. 🙂 I’m glad you found it helpful and thank you for sharing your tips! I like to wear a good size crystal pendant on a necklace. When I feel like I am absorbing someone’s energy (particularly negative energy) I will place my hand on the pendant on my chest to protect my heart center which is where I feel psychic attack the most. It definitely helps! thank you..i am so greatful for advice..that is simple. I do experience similar experience from Lauralee…people just have to touch me..there is time..it is way too much..their hands have to be on my back..and i feel it for days..is it not where the soul travel in ? from heart chakra from behind ? I am working on a few technique right now to help.. in developing them. today..i was with a stranger..and after a brief chant….i receive that information..when 2 people meet…there is exchange of field energy..like communicating vase..if heart is open..the one with highers frequencies..will help the 1 with lowest frequencies to tune up..when heart chakra is close..for any reason..( most of time it is out of fear ) the opposite happen..the 1 will lowest frequencies..brings you down. so…as a divine synchronicity..your tools and information..make much sense. thank you !!! WOW..thanks so much! I have always known I had some type of ability to pick things up on people and things but didn’t know what it was and have just tried to push it away. I just had someone ask me to look at a picture and tell me what I thought and I reluctantly did it…well I was spot on. So he said you really need to look into your abilities more because you could really be helping people. SO, I ran across your site. I can’t believe how much these things sound like me. I have critical ulcers that the Doctors have just said you are not responding to medicine so whatever is going on with you has to be a spiritual healing because the next step is to do a ByPass! This means they will have to cut part of my stomach out and re route it. After watching a couple of your videos I’m not wondering if this is why I have not been able to lower my stress and heal these ulcers?! Have you heard of other Empath’s having health issues similar to this where the Doctor’s can’t figure out why the medicines won’t work? TIA for any insight you may be able to give. Thank you very much Erin.. That felt WONDERFUL and PEACEFUL. Channeled in February 2018 by thora/thorivee/iveenia © with the help of heaven ♥ I am very grateful to all who helped. This is a full Meditation for the 5th Dimension and the Cleansing of our whole body. It can also be used partly if one or more chakras need to be boosted or cleared. Therefore, you will always find the salutation: “Dear Michael” there. Our Archangel Michael is a very helpful Angel. He loves us a lot and whatever there is – we can always ask him for his help. Dear Father Sky – dear Mother Earth – dear Archangel Michael – dear Angels – Thank you all for your presence. We ask you all for your help. Please send your light through the whole place where we are. (This can be anywhere – in a public transport, at home, at work) – wherever we are – we are ready to do something for all around us – please join us ♥ thank you. Dear Father – dear Mother – through your Dust and Earth and with Father Sky’s Breath, the divine Spirit, we were born. Please bless us with your love. We walk on your grounds, eat from your seeds and plants, drink your water – breathe your air and we live through your fire. You give us so much from you without asking anything back. Without you, we would not even survive. Please, dear Both, send your love through our whole system, help us to stand strong and hold our ground when the winds of life blow rough. Dear Mother and Father Thank you so much for your love which you show every moment of our lives. Dear Archangel Michael – you are the one who purifies our whole body. Please help us with this cleansing meditation. Thank you so much. We start with Mother Earth first: Dear Mother, please send your light from within you around and through our whole body from our feet to our Crown Chakra and further to the 22nd Chakra in the Fifth Dimension. Dear Archangel Michael, please help us to guide your bright light through our whole body. Should there be things to solve – let your golden rays clean and heal all our wounds – the visible and the invisible ones in all our bodies, our aura, our soul, our mind, our heart and from all our lives including the one now. The Feet, Ankles, Knees, and Legs Let our feet be in full light. The feet which connect us to our holy Mother Earth. Please bless this connection and clean them with your bright white light. Guide your light through the ankles through the shin to the knees. Enwrap the knees from both sides with your light. Make us aware that we many times are forced to bow to our lives or our difficulties and help us to remember that we can humbly and freely bow with gratitude when someone is pure and kind to us and loves us unconditionally. We forgive the ones who intentionally or unintentionally make/made us bow with all of our heart. Please guide your white rays through our whole legs, clean every part of them, and heal all there is to heal. Let your light fill our legs so brightly that there is no more shadow, just pure love. Thank you, dear Michael. Root Chakra Dear Michael please let your bright white rays chase all the shadows away and make us a pure vessel of light. Remind us that we are in and with God and therefore we are always safe and taken care of. God provides us with all we need. So, we can breathe and walk on our path in full confidence. Thank you, dear Michael. Sacral Chakra Dear Michael, please remind us that we are always loved and that we are always worthy of this love. Because only when we love ourselves we can love others. Bless all the people who step into our lives and make all our relationships worthwhile. When we part from each other, then let us part in love, as well. Because that is the only way. Please bless this chakra with your rays and make all the negative essences, entities and beings part, fill it with your rays so brightly that only love remains. Thank you, dear Michael. Solar Plexus Chakra Dear Michael, please fill this chakra back and front with your rays of light, so that all darkness vanishes and only a bright shadeless space remains. Let all who imposed their power over us leave. Cleanse all the negative feelings and enliven us with your energy. Let us know that we are in charge of ourselves, that the only power is when we take power over ourselves, to remain in balance, always. Make us aware that we have the strength to respond in love, that we can send light through this chakra to heal others when they are imbalanced. Please also make us aware that we protect ourselves. Thank you, dear Michael. Heart Chakra Dear Michael, please make us aware that our heart is more than “just a pump”. That our heart is, in fact, the initial organ. Send your rays through all the chakra from the front and the back, let it burst into dew drops of bubbling light – let those bubbles reach all the blood vessels, let them circulate through all the system make our body shine from within. And with all these enlightened dew drops send through all the compassion, unconditional love, and positive vibes. Let our hearts send happiness through the torus so bright that we ignite all beings around us with these positive rays. The hands are the extension of the heart: In our hands lies your healing power – dear Michael – please clean and recharge our hands with white golden light so we are able to receive and give your, God’s and Mother Earth’s healing power from us to others. Thank you, dear Michael. Throat Chakra Dear Michael, please send your rays to our throat awaken our voice in peace. Guide our voice through our heart that we only speak with/in love. So, our words will be the source to heal others, help them to awaken their life force and make them create wonderful masterpieces, be that in art or simply in speech/singing. With our positive frequencies, we heal ourselves at the same time. Let us speak/sing Light. Thank you, dear Michael. Third Eye Chakra Dear Michael, please send your rays of consciousness through our third eye chakra – include our pituitary and pineal glands. Enlighten us in all aspects. Our rays will expand and appear around our head as a natural halo. Should our third eye open – help us to endure this sight. Tell us what we will expect and guide us through this process, slowly. Make us send our inner messages in love to all creatures/entities and make them know that we have got the best intentions. All others who are not resonating on that frequency will leave us in peace because they cannot even notice us. We are strong enough because we know that we will be free from all harm. Thank you, dear Michael. Crown Chakra Dear Michael, please open the crown chakra now and shower us with all the light from all the Chakras above. With this the cycle is complete. All the bright rays which are in and around our body will now ignite in all their power. Our aura is our shield – it protects ourselves from other entities and beings, bacteria and viruses, fungus and all other essences which do not belong to our body. God created us in His divine light – Mother Earth grounded us with all Her love to be able to move on and in Her realm. We were/are created perfectly and so is our health – we are sending our light to the planet. With this, we help grow the planetary consciousness – we help the other human beings to awake and be as one. We are all one – we are all connected – in spirit and brother & sisterhood on this Earth. Thank you, dear Michael. Thank you, dear Mother and dear Father, – thank you, all Angels for your amazing presence and help during our transformation and readiness for the 5th dimension. Thank you very much Erin-Ashley – it helped a great deal – you wrote have you got so – here you are what arrived in February. Thank everyone on this for your loving advice and kindness. I love God and my family so much. I really want to be free of others energies so I can really be myself. I’m a good person and pray for a genuinely happy and healthy life. To be healed and help heal. To rise up together. To have fun and create and inspire. To feel safe and secure. To be calm, brave and intelligent. Just relax within God and Mother Earth blessings. Thnaks for the article. When I was working as a tattoo artist and skincare specialist I needed to be protective of my energy both in and out. My hands were often on people’s heads. While I worked I wore braclests that were made of sterling, copper and brass. They had small magnet on them and, one had the word love is ten languages the other the the word peace in 10 languages. I always imagined a warm, white, light bubble surrounding me to keep me safe. During this time I was always amazed at the personal information people shared with me!